The Professor Charles Mack Scrapbook is based on a formal collection of more than 500 newspaper clippings, programmes, handbills, business cards, invoices, photographs and other memorabilia documenting the life, times and career of Charles W. McCarty. 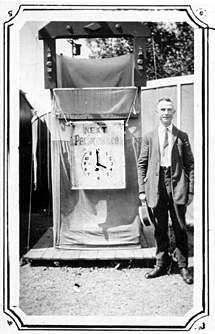 A celebrated ventriloquist, magician and punchman, McCarty as Professor Charles Mack, performed throughout New England, New York, New Jersey, and Pennsylvania from the 1890s through the 1920's. The Scrapbook documents McCarty's career and also sheds some light on how the traditional Punch and Judy characters and plays were affected by their migration from England to the United States. McCarty's career spanned a period of profound social, economic and political change. Throughout these constantly changing times, Punch and Judy shows were valued in large part because they resisted change. They remained a treasured tradition and an integral part of the cultural life of the religious, social, and business communities of the era as revealed in the artifacts presented here. The Punch Page is deeply grateful to Mr. Donald O'Keeffe, grandson of Charles McCarty. It is Mr. O'Keeffe's curiosity, generosity and willingness to share these resources that made this project possible.